Ever feel like needing to release your stress? Midterms got you down? 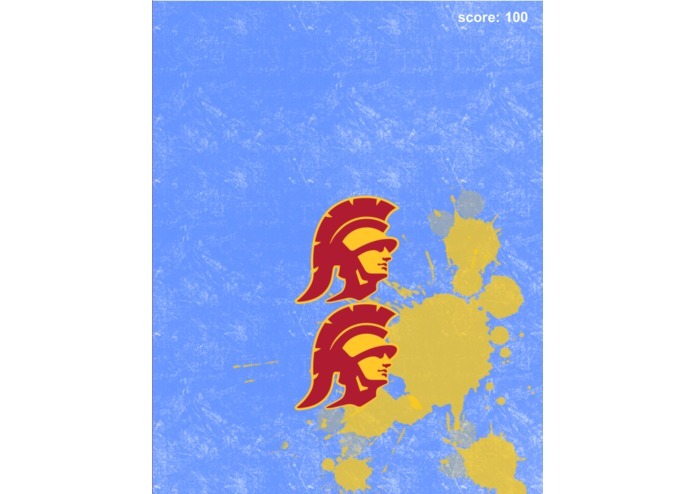 Splat the Trojans and show your Bruin Pride!! It's the Beat 'SC game today! And, of course, we won. We also want to avenge the vandalized Bruin Bear. Do you want to avenge the vandalized Bruin Bear, but in a classy, true Bruin style? Well, we've created the perfect game for you. Whether you'd like to take your rage out on the ruthless Trojans who dared to defile the sacred Bruin Bear, or simply distract yourself from the crushing pressure of midterms, this game is perfect for all ages and emotions. Whack-a-mole. But with Trojans. Splat as many Trojans as you can, within the time limit, to prove that you are, indeed, a True Bruin. The program is coded in Java using the Eclipse IDE. We initially tried to use Unity to code this game, but none of us had experience with it. We researched many Unity tutorials, however, many were using an earlier edition of Unity so the functions were different from the current edition. We then decided to code the project in Java. Only a few team members had experience with Java. We had difficulties finding the position coordinates of the mouse clicks and importing images. In addition, it took us time to figure out how to overlay the image of paint splatters on top of the image of the Trojan and how to make these images appear and then disappear. It was a challenge to scale the times so that the game wasn't too easy, while still maintaining a level of difficulty to keep the game fun. We also didn't know how to upload the code onto Github or export it as a runnable file, and we asked mentors for help with this as we ran into many errors. We were happy to have created a fully functional game within such a short time period. Also, we solved all of the problems that we came across. A particularly difficult issue was the image of paint splatters disappearing too quickly for the user to notice it. The solution was making a variable to keep track of the time when the Trojan was clicked. We learned how to use images and graphics, and register movements with the computer mouse in Java. We also further developed our skills in other areas of Java and used image editing for our project to make some of our graphics/backgrounds. Although we didn't use them in the final project, we also learned some of the basics of Unity and the Particle Internet Button. Add more levels and bring it to Android and iOS! yeah! Computer science student at UCLA.